The genre denoted SF is most commonly called science fiction, but some prefer speculative fiction instead. Either way, a precise definition of what constitutes science fiction can be as elusive as defining what constitutes life. As a scientist, I’ve always wanted more fiction that simply took place in the world of science, with scientist characters and problems – nothing far-reaching in speculation, nothing out-of-this world. Not even focused on astronomical issues per se, as a lot of sci fi is, causing some, like Margaret Atwood, to eschew the genre term merely due to this connotation of spaceships and intergalactic exploits. 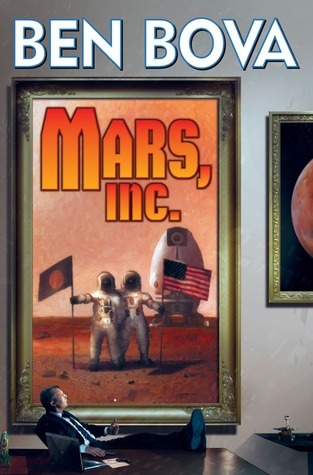 Mars Inc. comes close to being a science fiction book about getting the process of science done; it may be more accurate to say that Bova’s new novel is about technology more than science. Sadly, the cover as I see it here (the electronic edition has no cover) brings to mind far more clichéd science fiction space-faring than is in this novel. Instead the action is all on Earth. it is about getting to space again, about finding a way to move human enterprise and human exploration in the universe forward in a society that is increasingly hostile (at least politically) to doing this through public means, ie the government. Bova’s protagonist is a wealthy businessman with a soft spot and dream for increased space exploration, and he is committed to getting private sources (other rich men) to get it done, rather than the ‘damned government.’ This set up is intriguing and Bova uses it to explore all the difficulties his character has in getting this dream to come to fruition amid hostile and greedy business that is not out for the benefit of humanity. Despite the character’s hatred of government and belief that private capital can do better, in the end success is more due to his own tenaciousness against adversity and one gets the sense that if he were more open about governmental public works, and a little more familiar with that system as he is for private enterprise, he could have fought just as hard in that sector and gotten similar results. The novel therefore is not about the triumph of private income over public works, but rather the triumph of this particular character in using his own unique position and talents to get a job done and realize his dreams of scientific/technological possibilities – getting human beings to Mars. In these general respects Bova succeeds really well, and the novel’s plot is both captivating and believable. However, on the negative side, the novel suffers from being a bit too simplistic in the non-scientific or business aspects of the plot, it fits assuredly into the ‘genre’ mold. The character’s are primarily all male, one major female character is a secretary, the other is a scientist. Both are primarily used as predictable love interests, and in the case of the scientist, that is pretty much her only role. The novel doesn’t pretend to be anything other than what it is however, and what Bova is setting out to do here, he manages to accomplish well. If you like SF heavy on the process of getting science and technology to move forward or have an interest in the space program then this is assuredly a novel you’d want to check out. If you are looking for action on an alien world or something more complex than simple genre fare that emphasizes technology over other matters social, then it’s best to look elsewhere.